Seventy-seven-year-old American legend Glen Campbell pretty much puts a perfect capper on a spectacular career with See You There. This 14-song collection sees Campbell singing over some subtle new arrangements of his hits, made all the more poignant by the fact that this five-time Grammy Award winner is suffering from Alzheimer’s and won’t be touring or performing anymore. “Hey Little One” opens a strong country-flavored tune with Campbell still hitting high notes and sustaining perfect pitch. “Wichita Lineman” is presented in a less dramatic version (I urge you to seek out the original, as it is maybe one of the best pop songs ever written) and “Postcard from Paris” is bound to bring you to tears. “Waiting On the Comin’ Of My Lord,” the only new song here, is a knock-out even if we didn’t know about Campbell’s condition. Luckily we get lots of those Jimmy Webb songs Campbell is known for redoing: “Galveston” is a slow country take with Campbell in perfect form and on “By the Time I Get To Phoenix” Campbell sings over a tight AOR backing. 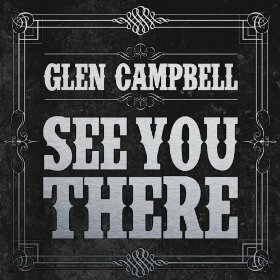 More than just a career retrospective, See You There is a celebration of Glen Campbell.